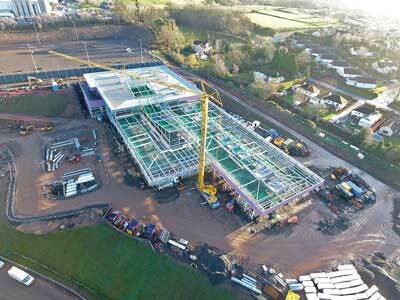 Overlooking a Scottish Borders town, an architecturally-impressive school campus has been constructed with a steel framing solution. Steel tonnage: 800tThree existing schools in the Scottish Borders town of Jedburgh will be relocating next year into a new, modern and architecturally-inspiring school campus. 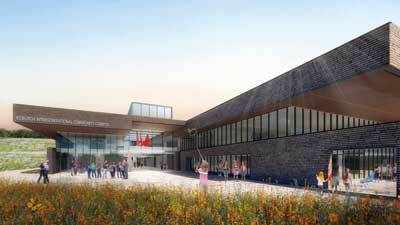 Known as the Jedburgh Intergenerational Community Campus, the £32M facility will have provision for up to 1,000 nursery, primary and secondary school children, alongside further education students. Meanwhile, serving the wider populace of the town, community facilities at the Campus will include a multi-use games area, 2G hockey pitch, 3G rugby/football pitch and a 100m running track. The Campus will also have a separate steel portal-framed rural skills building that will teach farming techniques. Positioned towards the top of a steep sloping site, the desire was always to have a stand-out and architecturally-impressive building, as the school will be visible from large parts of the town below. To this end, a steel-framed solution was chosen for the building, with precast planks used to form each of the upper floor slabs. “By using steel we’ve been able to work closely with the architect to design a regular, economic frame, which has allowed the saving in weight to be spent on the more visually exciting parts of the structure, such as the rooflights and cantilevers,” says Goodson Associates Project Engineer Euan Kerr. These rooftop cantilevers form canopies that will give some protection against the weather, as well as providing solar shade. The parapets at the end of each cantilever have been utilised to provide edge protection to the roof. At the main front elevation of the school building the cantilever is 7.5m-deep, while on the other facades the overhang is slightly shallower at 4.5m. 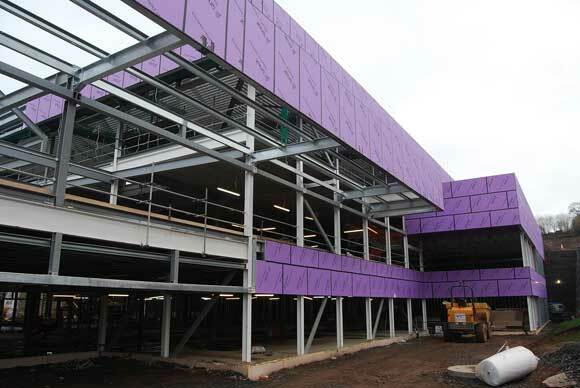 Internally, the steelwork and the precast ceiling soffit are all left exposed, thereby creating the desired modern industrial looking environment that also complements the open-plan layout of the school. There are no doors to many of the classrooms and plenty of break-out space, which all contributes to an informal and relaxed school design. Preparing a suitable flat plot for this stand-out school required main contractor BAM Construction to undertake a three-month long enabling works programme, in order to create several terraces to accommodate the building and its sports facilities. The school is positioned on two terraces, while the sports pitches are located on the top plateau, which is at the same level as the school’s roof. Four retaining walls have been formed to create the terraces, the tallest of which is 12m-high and positioned at the rear of the main school building. The retaining structures have been constructed as gabion walls using locally-sourced rocks to create a natural look. Once the considerable preparatory works had been completed, the main steel frame for the school building was erected by Hescott Engineering during a 12-week programme. Overall the steel frame forms one large structure which is two storeys high at the front and three storeys towards the rear as it works its way into the hill. One row of columns is supported on concrete piers set within the main retaining wall. The steelwork in this location overhangs a void between the Campus’s lower levels, forming an undercroft, which will be used to accommodate plant equipment. Above, the third-floor classrooms over-sail the undercroft and have access to a rear positioned playground on an upper terrace. The Campus is centred around a large entrance and atrium area that has a series of centrally-positioned rooflights. This is a large column-free double-height space and forms the zone where the school steps up from two to three storeys. The design brief for the Campus incorporates a journey through education, beginning with the nursery school at ground floor level. The nursery is located at the front portion of the two-storey block in front of the entrance, with primary school facilities above. Pupils will then continue their educational voyage along to the high school parts of the Campus which are located in the three-storey part of the school positioned towards the rear of the entrance/atrium. Predominantly the steelwork is based around a 7.5m column grid, as this was considered the most economic and efficient pattern for the classrooms. 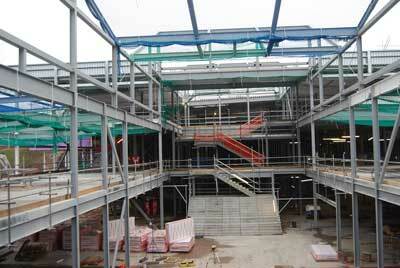 The only exceptions, apart from the entrance/atrium are the main assembly hall and sports hall. Both of these large column-free areas sit adjacent to each other, separated by a storage area, and are located at the rear of the school. These two double-height spaces are formed with long-span Westok cellular beams that not only form the large open spaces for the halls, but also act as transfer structures for the school’s third floor high school level, where the column grid returns to the project’s standard 7.5m column spacing. A series of 19m-long × 1.1m-deep cellular beams has been used for the sports hall. These sections, weighing 6t each, were the heaviest individual steel elements on the project. They arrived on site in two pieces, measuring 15m and 4m-long respectively. “The complete beams would have been too long to transport up the access road which has a couple of tight bends,” says Hescott Engineering Contracts Manager Tony McAleese. The beams were spliced together on site before being lifted into place as complete members. The cellular beams, like the majority of the project’s steelwork, will be left exposed within the completed scheme and so the bolted connections will be feature elements. There were no such transportation challenges encountered for the assembly hall beams as these members are slightly smaller at 15m-long × 900mm-deep. The Campus is scheduled to be complete by Spring 2020.